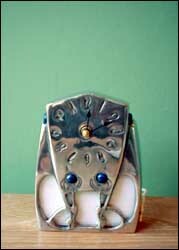 Pewter and enamel clock, designed by Knox for Liberty. The inauguration of the Cymric range had been held at an exhibition in May 1899, at the London showrooms of Liberty & Co in Regent Street. To mark the event, a thirty-two page illustrated catalogue had been issued. Later that year, in the autumn, Libertys had taken the clever and courageous step by presenting the new work to the Arts and Crafts Exhibition Society. Clocks formed an important category, silver and pewter designs being distinctly different from each other, enamel used sparingly with the silver, more with the pewter, with occasional use of mother of pearl. Knox returned to the Isle of Man in 1900, from where he continued to supply Liberty with new designs. He came back to London in 1904 to teach, still supplying Liberty & Co with designs until 1912.